Hey friends! So you wanna learn one stroke? You're in the right place! I've been getting SO many questions about how I do my one stroke flowers, that I wanted to share my technique with all of you. Click to see my video tutorial! Soooo yeah, here it is! My technique isn't perfect, nor is it the 'official' way to do one stroke. I taught myself by watching videos, reading websites and practicing, practicing, practicing! All you need is a flat brush (I got mine from eBay), and acrylic paint in two colors. You dip the corner of the flat brush into one color, and the other corner into the other. Swipe it along a surface (like a piece of paper) several times to make the gradient, and then you can paint your petals. It takes some practice but then it's not so hard! I'm working on a piece of foamboard with black backing, and I covered it with the inside of a laminating pouch. 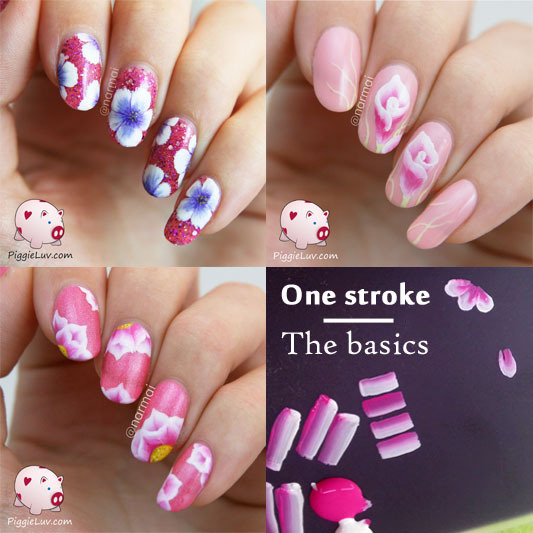 One stroke works SO much better on a rough surface, so you might want to use a matte top coat before trying this on your nail, and practice on paper or something else that's slightly rougher than a smooth top coat. The designs in the collage are my first try at one stroke, my pink calla lilies (inspired by Lucy's Stash) and my my dahlias. They all have tutorials as well so when you get the hang of this, you can visit the others and try those out! And don't forget to have fun!